When you want a wildflower effect why not turn to a true native wildflower- one that improves under cultivation. 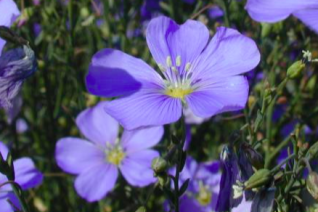 Blue flax is a native of prairies and hot hillsides on the west side of the Cascades. Thin multiple stems rise to 18″ tall and bear a succession of single sky blue flowers. Light and airy and blue and native. Easily grown perennial for full sun and rich well drained soil. Light summer water. Takes summer drought by quickly going dormant after blooming. With irrigation it stays with us blooming until autumn. Drought adapted. Reseeds in open soil. Tiny rosette of leaves or none in winter. Oregon native plant.